The film Gladiator, directed by Ridley Scott was a hit in the movie industry. Hence, it is not surprising that the movie scooped the prestigious Oscar award and now has a thrilling Playtech slot production that has been keeping online casino players worldwide at the edge of their seats. 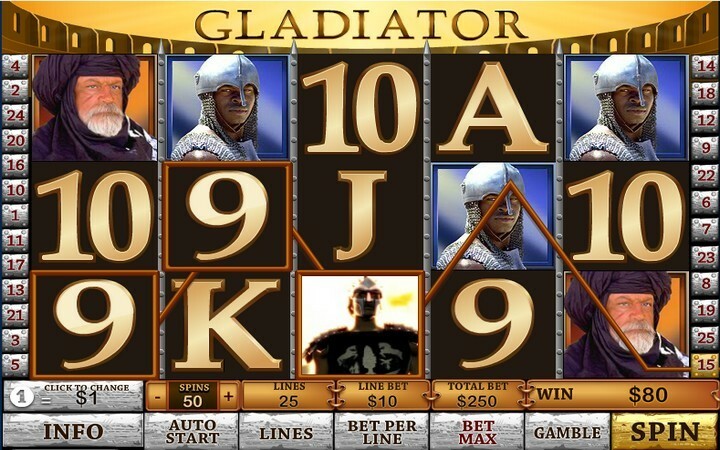 To match up to the film’s superb standards, Playtech has ensured that Gladiator Slot Machine is abounded by an alluring ancient theme backed up by sound effects that will help you relive General Maximus’s epic journey of revenge. This is just a glimpse of the thrilling Gladiator Slots Game. To garner more information, continue reading this review and I can guarantee that you will not be disappointed. The Gladiator Mask can replace any character on the reels except for the scatter to maximize your chances of landing a winning combination. Apart from that, the Gladiator mask can activate a rewarding bonus round each time it lands on the second, third and fourth reels. Gladiator Bonus Feature – this feature contains helmets that contain prizes of either 2.5, 7.5 or 12.5 coins. Collect nine helmets and add up all the coins revealed from the type of helmet you selected. The Coliseum icon acts as the scatter, that said, land three or more coliseum symbols to activate the crowd pleaser bonus. Coliseum Bonus – this feature consists of the free spins feature and multipliers that you will reveal by clicking on the first and second row respectively. To spice things up, land on the Emperor Symbol on the third reel to earn 24 extra free spins and a ×3 multiplier. As if that’s not enough, landing on five Emperor Symbols earns you the 5000 coins jackpot! Double your wins by correctly selecting the color of the card in this feature. General Maximus’s journey to revenge might have been full of turmoil but your journey to accomplish the goal of Gladiator Slot Machine is quite the opposite. Simply land three or more similar symbols on an active payline to win cash. To achieve this, start by selecting the number of bet lines and wager you want to play with. To select the number of paylines, click on the + and – button to increase and decrease the bet lines respectively. As for the stakes per line, click on the ‘Bet per Line’ button until the wager you want to play with appears. Once you are done with this step, click on the spin or auto play button to Play Gladiator Casino. Take note that if you want to play with the maximal bet, click on the ‘Bet Max’ button and the reels will start spinning immediately. The lowest bet you can stake is $0.01 while the maximum bet you can wager is $0.25. However, if you want to deposit large wins into your bank account, always go for the maximal bet. Playtech has availed Gladiator Slots Free to give you an opportunity to acquire the best gaming skills before attempting to play the game for real money. Furthermore, you can play Free Online Gladiator Slots on your mobile device. Surely, online casino gaming has never been this convenient.